Great chefs live by the rule that you must start with the very best ingredients. They also are reluctant to use preservatives. 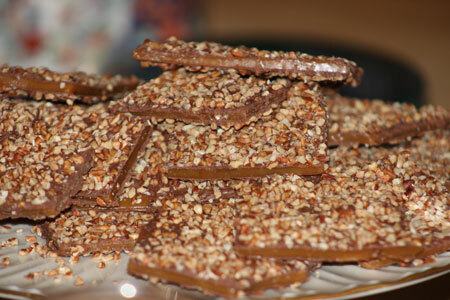 With that philosophy we have been making our delicious pecan covered Toffee for over 30 years. We have stayed with the same recipe from the beginning but once we began offering it to the public we found a need to pour it very thin. This makes it crisp but not so hard that it will damage your teeth. Until about 20 years ago we only made the Toffee as gifts for friends and relatives at Christmas time. What started our career as commercial candy producers happened very much by accident as is so often the way. We made some Toffee for a charity to sell at their Bazaar. They promptly ran out. In fact they were out of our Toffee within the first fifteen minutes. We began to receive calls for more so we started taking orders. Gradually we began to take space at local church bazaars and send out flyers reminding people how great it was as a gift at Christmas. Growth has been largely by word of mouth Once you taste it you are hooked. In fact many of our customers say it is "habit forming". Response has been so good we set up a proper kitchen at our ranch not far from Houston. We obtained approval from the Texas Department of Health and The Texas Department of Agriculture granted us the right to use their logo on our packaging and literature. Our first packaging was in plastic baggies with seasonal ribbons. Over time we have switched to colorful tins. We select tins for various seasons. It is not just a Christmas business any more. We like going to Bazaars. These shows have been a wonderful way to meet a lot of people, let them taste the Toffee and give them a brochure. We found we were getting a lot of orders as a result. In one of the early shows we realized we didn't have a small packet of Toffee people could carry around or put in their purse. We created one and offered it in our first show at The Houston Livestock Show and Rodeo. People would buy one and come back a little later saying they had eaten it walking around. So we named it the Walkaround and although we do not offer it for mailing it is very popular at the shows. We decided that we should be doing more shows and in 1997 we began to take booths in Dallas, Austin, and San Antonio. This proved to be very successful and now we are going to shows on a regional basis, not just in Texas. And too, here we are on the Web. We hope you will try our unique approach to candy that has traditionally been poured thick enough to hold an almond in the center. Remember, ours is thin but crisp and therefore has more chocolate and pecans per bite. Enjoy!